The MeGITS Press: Winners of Quest INGENIUM 2017! Our graduates have once again made us proud! 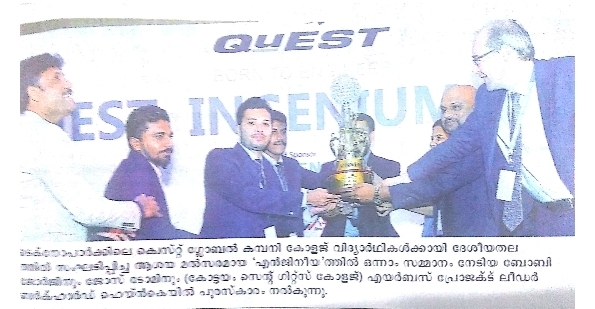 Jobby George and Jose Tom, Mechanical Engineering students of 2017 batch, have become the winners at the QuEST Ingenium 2017 that was held on 15th September in Trivandrum. This was from a competition that saw nearly 6500 projects from all over the country! They won the top honours for their project – Electricity Generation Using Speed Breakers. Apart from the cash prize of Rs. 1 lakh, these two students will also get an all-expense paid trip to the Airbus facility in Germany where they will be given an exclusive tour of the facility and introduced to the manufacturing processes and cores engineering side of the business. 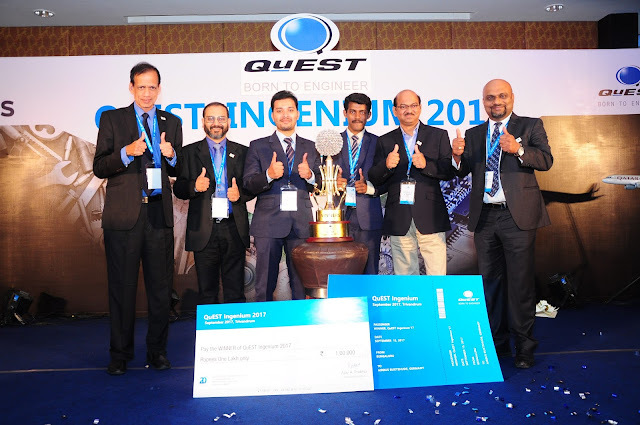 The project team also consisted of Cibin Geevarghese, Amal Abraham and Glen Martin Thomas. The project was guided by Asst Professor Arun K Varghese.